How can I run MMD on a MAC? Find out how a virtual machine runs MMD on a MAC. How do I setup a virtual machine to run MikuMikuDance on a MAC? Windows 7 Virtual Machine runs MMD MikuMikuDance on MAC or Linux! After I wrote my post on “Why MMD cannot run on MAC computers”, I began to do more research as I discovered that people CAN install Windows on their machines using Bootcamp and other software. I find the software around shops all the time and they are pretty pricey and I haven’t had much success with the software… but I found an easy and genuine way to get a virtual Windows working on other operating systems through Microsoft’s website with VirtualBox! 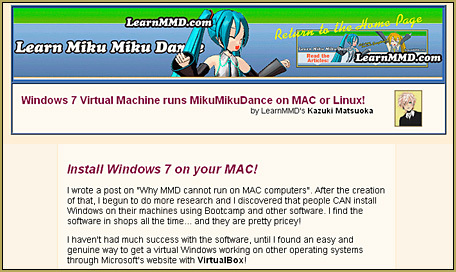 SEE MY NEWEST Full-Page ARTICLE where I will show you how to install a Windows 7 virtual machine that will be able to run MikuikuDance! Of course, not all MACs, not all computers, can RUN a virtual machine… or have the disc-space or graphics cards to manage it! My article describes some of these concerns… but you will have to discover, for yourself, if your machine is up to the task. See how to download and install a virtual machine that may allow you to run MMD on your MAC! I’m not sure if I can run this on my MacBook Air…Can you please reply to see if I can? I love to watch MMD on youtube and I think it’s really cool! You will have to try and find out. All instructions are outlined in this article, now it’s up to you. There are MMD apps for Mac, specifically MMDA12 and nanoem, but I don’t know how to work those things.